It's Raining All Over The Universe : 13.7: Cosmos And Culture We are part of something much larger than ourselves — and our ideas about ourselves, says astrophysicist Adam Frank. How can we be sure? Because, without doubt, it is raining all over the universe. Saturn's rings cut across this view of the planet's largest moon, Titan, in this image taken by the Cassini spacecraft on May 12, 2011. This morning I woke to the sound of rain on the roof. Is there any music more beautiful? It's the perfect reminder of nature's grounding cycles from which we also emerge and disappear. But being an astrophysicist, I was suddenly struck by the realization that Earth is not the only world that knows rain. There is rain falling in many other places in the cosmos. Lying there, listening to the drops falling on the roof, that fact suddenly seemed to carry a lot of weight. Titan, the haze-shrouded moon of Saturn, hosts rainfall. Given its great distance from the sun, however, what falls from the sky on Titan is not water but liquid methane at the distinctly chilly temperature of minus 180 degrees Celsius. 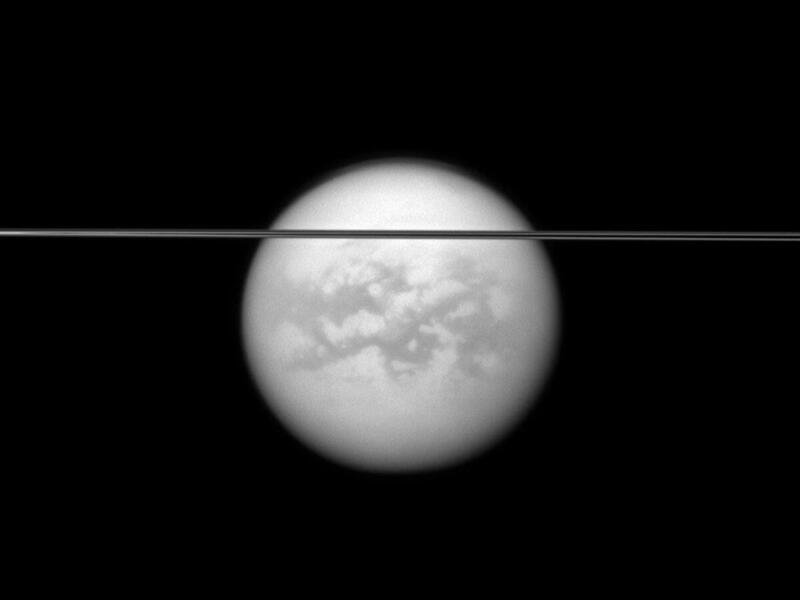 Over the past decade, NASA's Cassini probe has sent back images showing Titan's surface darken as cold rains fall and replenish the moon's methane seas. Venus also has rain. Sulfuric acid condenses into droplets that fall through its hellish atmosphere only to evaporate before they reach the ground. And deep within Saturn, scientists believe, helium may condense as drops and fall through a vast sea of liquid hydrogen. Mars' atmosphere is too thin to allow rain, but the Phoenix Lander saw a frost of "diamond dust" falling in the mornings. Mars is also no stranger to fog, which has been seen collecting in canyons and craters. And beyond our solar system, we now know the Milky Way galaxy hosts some 10 billion planets. Among that multitude will be many worlds enshrouded in the thin layer of gases we call an atmosphere. And with atmospheres, there surely will come cycles of evaporation and condensation. In other words: There will be rain. Across the galaxy, on countless worlds, there will be rain. It will fall across as many windswept plains as you can imagine, and it will darken more shorelines than you can count. There will be rain falling on mountains and there will be rain sweeping in sheets over dark seas. At any moment, it will be raining on worlds across the universe. And all of these rains matter. We tend to think of ourselves as special, as unique. Our personal stories are so vivid and important to us. Our collective cultural history, expressed in our conflicts this moment, seem so pressing and so urgent. But we really don't understand what is happening to us at all. We really don't understand who we are or what we are. That's why all these rains matter. They help show us. In truth, we're just an expression of one planet at one moment in its many billion-year history. And looking beyond this world, it's clear we're part of a long, long experiment in possibilities the universe is running over and over again. All our enormous efforts at war and hatred and separation are simply a failure to understand this simple fact. We are part of something much larger than ourselves, and our ideas about ourselves. And how can we know this is true? We can know because, without doubt, it is raining all over the universe.